Series exploring how the human body tells the story of our evolution. 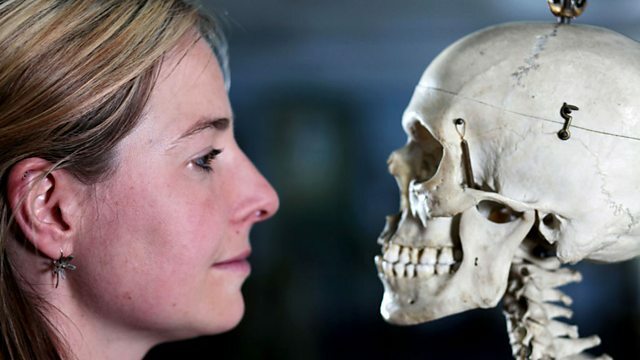 Dr Alice Roberts looks at how our skeleton reveals how our ancestors stood, walked and ran for survival. Trekking through the forests of our ancient ancestors, she goes to meet the apes who still live there today - chimpanzees. In six million years we have become very different, and what kick-started this can be found in an extraordinary fossil - Sahelanthropus. A single hole where the spine was attached suggests that our ancestors started the journey to being human by standing upright. We take it for granted, but standing up and walking is surprisingly complex - each step involves the co-ordination of over 200 muscles. Charting the major advances from Australopithecus to Homo erectus and beyond, Alice tells the epic story of human evolution through our body today. New research has uncovered clues in our ankles, waists and necks that show how our ancestors were forced to survive on the open plain - by walking and running for their lives. From the neck down we have inherited the body of our ancestor Homo erectus, who lived on the plains of Africa nearly two million years ago. Finally Alice looks at probably the most important advance in our evolutionary story. A fortuitous by-product of standing up was freeing up our hands. With pressure-sensitive gloves, she demonstrates how the tiniest of anatomical tweaks to our thumbs and little fingers transformed hands that evolved to grasp branches into ones that could use tools. And with our dexterous hands, our species, Homo sapiens, would change the world. The fossil cast at 08:40 in the Bones show is in fact KNM-ER 1813 rather than TM266-01-60-1. However, the information stated about the fossil Sahelanthropus is correct.